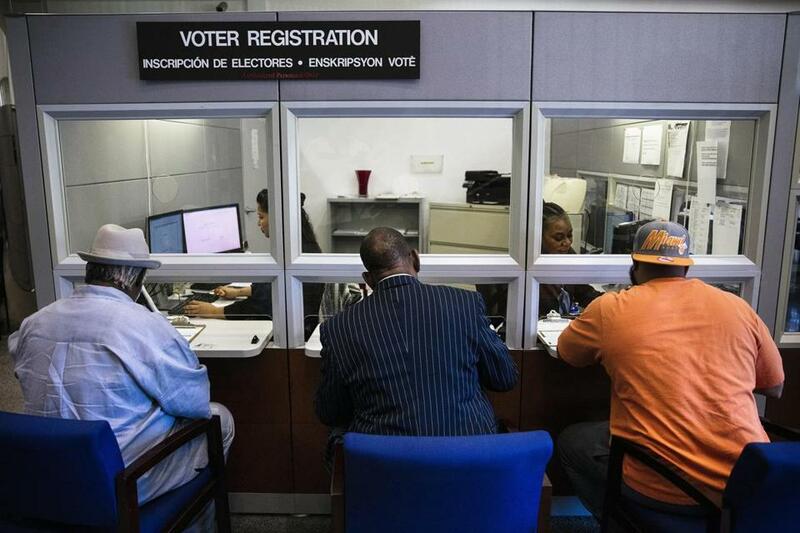 From left, Lorenzo Latson Sr., Clarence Office Jr., and Jerry Armstrong complete their voter registration at the Miami-Dade County Elections Department in Doral, Fla., on Jan. 8, after a historic amendment to the Florida Constitution restoring the voting rights of former felons went into effect. In November, 64 percent of Floridians — more than five million Democrats, Republicans, and independents — stood together and ended the unfair, antidemocratic practice of felon disenfranchisement. They restored the voting rights of more than 1.4 million neighbors who’d served their time and earned back every privilege of citizenship. It may have been the most meaningful expansion of democracy in decades, since there were 5.8 million former felons nationally who couldn’t vote. Felon disenfranchisement is one of America’s earliest and longest-lasting forms of voter suppression. Florida has long been its ground zero. More than 10 percent of all adults — and almost a quarter of African-Americans — lost their voting rights permanently because of a conviction, an extra punishment of civic death continuing long after their release. Now Republicans in Florida’s state legislature are trying to sabotage the will of the people in the ugliest way possible: a modern-day poll tax. A House committee has advanced a bill that retroactively alters the amendment and strips all Floridians of their voting rights if they have not paid court fines and fees related to their case, even if those fines were not part of their original sentence. Hundreds of thousands of people could be affected. It could require some of the most vulnerable and impoverished Floridians to generate hundreds of millions of dollars, collectively, to become citizens again. They hit on the solution during an 1868 constitutional convention: Florida bitterly accepted the 14th Amendment to the US Constitution in order to get back into the Union, but then wrote felony disenfranchisement into their state constitution, guaranteeing that actual equality in voting would be an illusion. Florida’s new constitution and “Black Law” turned low-level crimes — vagrancy, petty theft, and similar crimes they believed most likely to be committed by the former slaves — into felonies. Florida’s practices aren’t much fairer today. A study by the Brennan Center documented how Florida has added 20 additional categories of fines and fees since 1996, often burdening those formerly convicted with hundreds of thousands of dollars of debt as they reenter society, jobless and often destitute. It breeds never-ending debt and sometimes makes it impossible for people to hold a driver’s license after their release, let alone a job to pay off mounting bills. The Brennan Center calls this “cash register justice,” and it accomplishes two tasks: Those who can pay help Florida finance its criminal justice system. Those who can’t wind up back in court or have their licenses suspended for failing to pay exorbitant fees. Then the state sells the debt to outside collection agencies that add as much as 40 percent interest atop already crushing bills — an addendum to private prisons. It’s a scheme. There’s always a scheme. Those who want to keep African-Americans away from the polls haven’t given up since ratification of the 15th Amendment in 1870. They know the key to liberating the nation is the South and the key to liberating the South is the African-American vote. First it was the poll tax, literacy tests, and voter intimidation. It took decades of marches, sit-ins, arrests, and even murders before the civil rights movement realized the 1965 Voting Rights Act. Since then it’s been gerrymandering, voter ID laws, purges of voting rolls, strategic precinct closures in black neighborhoods, or just fewer machines, resulting in longer lines at our polling places to discourage voting. Now that a pro-democracy movement is advancing a powerful set of electoral reforms, it’s the poll tax again. We must not allow the return of a modern-day Jim Crow law. Floridians voted in a nonpartisan manner for fairness last November. Even as they elected a Republican governor, a Republican US senator, and a GOP state legislature, a supermajority of Floridians still made it clear they believed voting rights must be returned to citizens after they’ve completed their sentence. The language of the amendment was equally clear: Once a citizen is free, they have full citizen rights and should be entitled to the most fundamental right, the right to vote. The 64 percent of Floridians who amended their constitution did not intend to prevent those who can’t afford to pay unreasonable fees to remain voiceless for the rest of their lives. We cannot allow a small cadre of legislators to turn back the clock on democracy — not to 1868, 1964, or to pre-November 2018, when Floridians won this crucial and inspiring victory not only for voting rights, but also for fairness and democracy itself.